The Injection Valve and Sample Loop is a complete module allowing barcoded mRNA capture beads in lysis buffer to be efficiently flowed through the RNA-Seq Chip without clustering or blockages. Bead damage prior to encapsulation is negligible as harsh mechanical stirring is unnecessary, and its four-way valve and simple, compact microfluidic connections enable seamless switching between the injection of the bead suspension and pumping of a driving fluid, with minimal dead volume and bead wastage compared to traditional syringe pump methods. 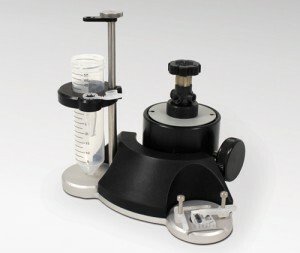 The integrated mirror and chip holder enable easy visualization via the RNA-Seq System’s high speed microscope and camera, and the module also incorporates a Falcon®/Eppendorf® tube holder for easy collection of the droplet emulsion.